Home cooked recipes are the best! Not only does cooking at home save you money but you can tailor the food to fit your families tastes. As much as I enjoy cooking at home it can be time-consuming at times. I’m always on the hunt for easy home cooked recipes. The key to cooking more meals from home is planning out your menu. Some like to do it a month in advance, but I’ve found that planning a week at a time helps me. Do what works best for you and start cooking more meals from home! In need of some recipe inspiration? 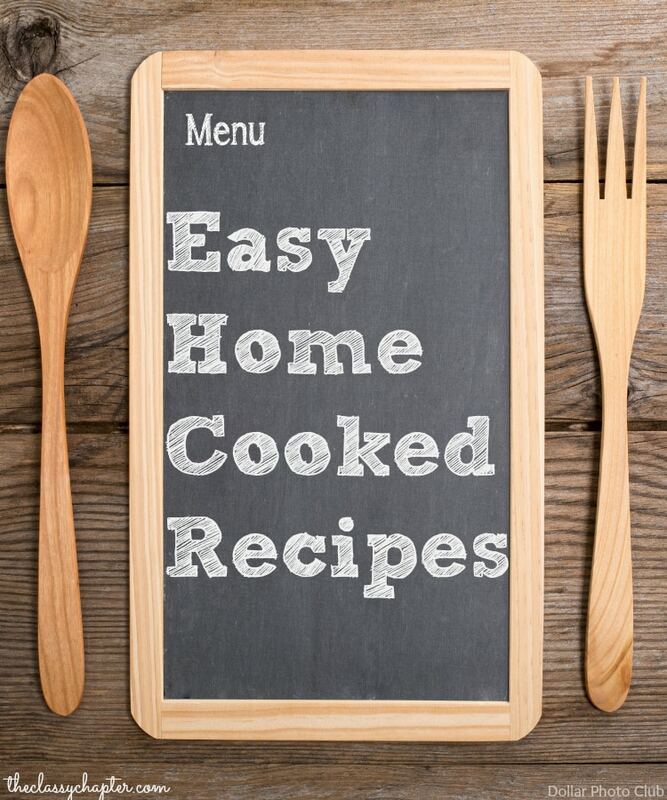 You’ll find a variety of recipes below. Easy appetizers, dinner recipes and even breakfast options. Chicken Pad Thai Recipe – The perfect weeknight meal in under 30-minutes. Louisiana Beer Cheese Soup – This soup is bound to impress anyone you are cooking for. Firecracker Salmon Recipe – Copycat Cheesesteak Factory Recipe. Crockpot Chicken: Sweet n’ Spicy – An easy crockpot dish for those days you don’t want to cook. Korean Taco Recipe – Lots of spice but even the kids enjoyed it. Homemade Posole – Traditional Mexican soup that is oh so tasty. Chicken Panini Sandwich – Perfect lunch or dinner option. Chicken Bacon & Green Bean Skillet – This 30-minute dish has so much flavor and bacon! Easy Salsa Recipe – Loaded with flavor and oh so easy! Homemade Pretzel Sticks – These pretzels sticks are so good and made from scratch! Bacon Wrapped Jalapenos – So easy and so tasty. Crab Rangoon Dip – This is a crowd pleaser and perfect for game day parties. Candy Bark Recipe – While this one is for Easter you can make this any time of the year. 10 Delicious Easter Desserts – 10 tasty recipes for Easter. 25 St. Patrick’s Day Desserts – Everything you could possibly want for St. Patrick’s Day. Chocolate Mint Pretzels – Mint flavored chocolate pretzels. Chocolate Bacon Pretzels – Salty and sweet you seriously can’t go wrong with this. Homemade Mint Chip Ice Cream – Making homemade ice cream doesn’t have to be hard! 15 Delicious Valentine’s Day Treats – Everything you need to make your Valentine’s Day sweet. 10 Amazing Christmas Cookies – Christmas cookies are the best and you’ll love these! Bacon S’Mores – Traditional s’mores are great but add bacon and they’re amazing. Peppermint Meringue Cookies – These no-bake cookies are perfect for the holidays. Root Beer Float Martini – A fun and tasty drink for the adults. Mango Martini – This is the perfect summertime drink. Make sure to check back often as new recipes are always being added. In the mean time be sure to follow me on Pinterest.